How about spending few days with the last race of an age old civilization in a place existing from the Neolithic ages? They do exist in the heavenly destination sought after by the tourists round the year in Jammu & Kashmir, a beautiful state in North India. They are the Dards, the clan of Aryans existing since the period of Indus Valley Civilization. Flanked by mountain ranges on all four sides with the largest brackish lakes and deep valley habitats, the splendid Leh Ladakh welcomes you to enjoy the scenic tranquility immersed with the colorful celebrations and rituals. The upland plateaus, the ecosystem balanced by the wild life and the areas of dense vegetation, which are contradictory to one another are the highlights of this region. The majestic mountain peaks, the silky glaciers, beautiful valleys, hot springs, sun bathe in the sand dunes, safari in a double humped camel, trekking in the unexplored mountains, rafting in the rivers, what else can make one’s life more meaningful? 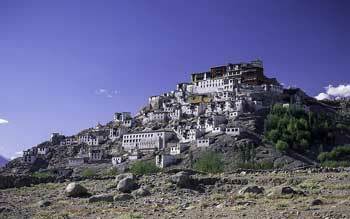 Still You have lot more to explore and enthuse in the land of God’s creation Leh-Ladakh.